The V.O. 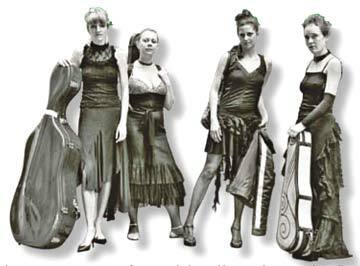 Quartet is not a typical string quartet! Although classically trained, these four breathtakingly talented women draw upon a wide range of musical flavours to create their unique and bewitching brew. Their influences include folk music from Ireland, Great Britain and South America; Klezmer and Gypsy music; contemporary pop and jazz. These different styles are combined to create a concert of strong melodies and haunting harmonies that will make you want to laugh, cry or dance! This is a group unafraid to engage with their audience. V.O Quartet shows are intimate and chatty, with warmth and humour shining throughout the performance. Don’t miss it!